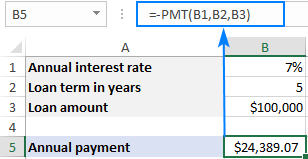 The tutorial shows how to use PMT function in Excel to calculate payments for a loan or investment based on the interest rate, number of payments, and the total loan amount. Before you borrow money it's good to know how a loan works. Thanks to the Excel financial functions such as PMT, PPMT and IPMT, computing the monthly or any other periodic payment for a loan is easy. In this tutorial, we will have a closer look at the PMT function, discuss its syntax in detail, and show how to build your own PMT calculator in Excel. What is the PMT function in Excel? The Excel PMT function is a financial function that calculates the payment for a loan based on a constant interest rate, the number of periods and the loan amount. "PMT" stands for "payment", hence the function's name. For example, if you are applying for a two-year car loan with an annual interest rate of 7% and the loan amount of $30,000, a PMT formula can tell you what your monthly payments will be. To be in line with the general cash flow model, the payment amount is output as a negative number because it's a cash outflow. The value returned by the PMT function includes principal and interest but does not include any fees, taxes, or reserve payments that may be associated with a loan. 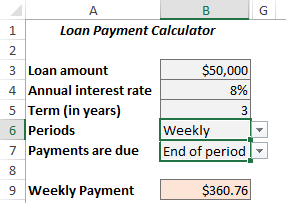 A PMT formula in Excel can compute a loan payment for different payment frequencies such as weekly, monthly, quarterly, or annually. This example shows how to do it correctly. The PMT function is available in Excel for Office 365, Excel 2019, Excel 2016, Excel 2013, Excel 2010 and Excel 2007. Rate (required) - the constant interest rate per period. Can be supplied as percentage or decimal number. For example, if you make annual payments on a loan at an annual interest rate of 10 percent, use 10% or 0.1 for rate. If you make monthly payments on the same loan, then use 10%/12 or 0.00833 for rate. Nper (required) - the number of payments for the loan, i.e. the total number of periods over which the loan should be paid. For example, if you make annual payments on a 5-year loan, supply 5 for nper. If you make monthly payments on the same loan, then multiply the number of years by 12, and use 5*12 or 60 for nper. Pv (required) - the present value, i.e. the total amount that all future payments are worth now. In case of a loan, it's simply the original amount borrowed. Fv (optional) - the future value, or the cash balance you wish to have after the last payment is made. If omitted, the future value of the loan is assumed to be zero (0). 0 or omitted - payments are due at the end of each period. 1 - payments are due at the beginning of each period. Please remember that the payment is returned as a negative number because this amount will be debited (subtracted) from your bank account. By default, Excel display the result in the Currency format, rounded to 2 decimal places, highlighted in red and enclosed in parenthesis, as shown in the left part of the image below. The image on the right shows the same result in the General format. Tip. To calculate the total amount paid for the loan, multiply the returned PMT value by the number of periods (nper value). In our case, we'd use this equation: 24,389.07*5 and find that the total amount equals $121,945.35. Below you will find a few more examples of an Excel PMT formula that show how to calculate different periodic payments for a car loan, home loan, mortgage loan, and the like. Fv omitted - implies zero balance after the last payment. Type omitted - payments are due at the end of each period. If your loan conditions are different from the defaults, then use the full form of PMT formula. 0 (regular annuity) - payments are made at the end of each year. 1 (annuity due) - payments are made at the beginning of the period, e.g. rent or lease payments. For rate, divide the annual interest rate by the number of payments per year (which is deemed to be equal to the number of compounding periods). For nper, multiply the number of years by the number of payments per year. For instance, to find the amount of a periodic payment on a $5,000 loan with an 8% annual interest rate and a duration of 3 years, use one of the below formulas. In all cases, the balance after the last payment is assumed to be $0, and the payments are due at the end of each period. Before you go ahead and borrow money, it stands to reason to compare different loan conditions to find out the options that suit you most. For this, let's create our own Excel loan payment calculator. To begin with, enter the loan amount, interest rate and loan term in separate cells (B3, B4, B5, respectively). Set up the lookup tables for Periods (E2:F6) and Payments are Due (E8:F9) like show in the screenshot below. It is important that text labels in the lookup tables exactly match the items of the corresponding drop-down list. In the cells next to the drop-down lists, enter the following IFERROR VLOOKUP formulas that will pull the number from the lookup table corresponding to the item selected in the drop-down list. The fv argument (0) is hardcoded in the formula because we always want zero balance after the last payment. In case you wish to allow your users to enter any future value, allocate a separate input cell for the fv argument. The PMT function is preceded with the minus sign to display the result as a positive number. The PMT function is wrapped into IFERROR to hide errors when some input values are not defined. A #NUM! error may occur if either the rate argument is a negative number or nper is equal to 0. A #VALUE! error occurs if one or more arguments are text values. If the result of a PMT formula is much higher or lower than expected, make sure you are consistent with the units supplied for the rate and nper arguments, meaning you have correctly converted the annual interest rate to the period's rate and the number of years to weeks, months, or quarters as shown in this example. That's how you calculate PMT function in Excel. To have a closer look at the formulas discussed in this tutorial you are welcome to download our PMT Formula Examples. I thank you for reading and hope to see you on our blog next week!